Why now the campaign of violence against Israel? The Israeli explanation, espoused by Prime Minister Ehud Barak and other officials, blames Yasser Arafat; he turned it on and he can turn it off. Why did he start the violence now? Shlomo Ben-Ami, the acting foreign minister, says he wanted to distract attention from American "bridging proposals" intended to break the deadlock in his negotiations with Israel. But this fails to account for all the violence outside Arafat's control. Hizbullah, the Lebanese Islamist organization, captured three Israeli soldiers and shelled Israeli positions. Israeli Arabs resorted to unprecedented violence. Hundreds of thousands of Egyptians and Moroccans took to the streets shouting anti-Israel slogans. Saddam Hussein promised to "put an end to Zionism." Focusing on the role of the Palestinian Authority, in other words, misses the larger point, which is that the violence of the past two weeks results from a growing mood of exuberance in the Palestinian and Arab "street." That mood has deep roots. When the State of Israel was declared in 1948, Arabs widely assumed they could quickly snuff out the nascent Jewish country. This confidence eroded as the Arabs lost one war after another: 1948-49 and 1967 marked the worst defeats; 1970 and 1982 were also bad; and 1956 and 1973, though portrayed as political victories, were widely recognized as military disasters. For Arabs, the lowest point came in 1991 with the defeat of Iraq and the dissolution of the Soviet Union. Victory over Israel appeared very remote indeed. Then, at its moment of greatest power, instead of destroying the PLO, Israel in 1993 magnanimously extended a hand in friendship toward it. In what became known as the Oslo process, the government recognized Arafat as a "partner for peace." It took this step assuming that Palestinians and their supporters had learned from their 45 years of failure to destroy Israel; and that, sobered by this experience, they would now accept the permanent existence of a sovereign Jewish state in the Middle East. But, as every survey (plus much other evidence) shows, most Palestinians as well as their Arab and Moslem allies did not give up on the hope of destroying Israel. Instead, they put this ambition in the freezer, to be thawed out at a future date when again opportune. That thaw began surprisingly quickly. Acting from a sense of strength, Israeli leaders, Labor and Likud alike, encouraged a friendly Palestinian disposition by handing over land, granting political autonomy, helping with economic development, and generously conceding on contentious issues (such as the control of holy places). They also did not hold the Palestinians to the letter, or even the spirit, of signed agreements. This Israeli high-mindedness prompted not reciprocal feelings of constructive intent but a boisterous sense of Palestinian strength. What began as cautious winks and tentative statements soon turned into open defiance and explicit hatred. By the time of the Camp David II summit three months ago, the Palestinian mood had reached such a state of enthusiasm that the "street" prevailed on Arafat to turn down even Barak's shockingly generous concessions. These they found too little, too late. With this rejection, Palestinians signaled that they had no more need to truck with the Zionist enemy; from now on, they implied, the Hizbullah method of victory through force would be their model. But Israel's leadership, myopically projecting on to the Palestinians its own hopes for a harmonious resolution, ignored the reality that they were preparing for a violent offensive. In late September, in a spirit of exhilaration and even millenarian expectation, the Palestinians finally initiated a new round of violence. More than any other single act, the desecration of Joseph's Tomb, a Jewish holy site, symbolized their triumphalist spirit. The more modest of them spoke of liberating the Temple Mount or Jerusalem; the more ambitious saw their actions as a first step towards the destruction of Israel itself. Looked at historically, the Palestinian and Arab mood vis-à-vis Israel is today more resolute and optimistic than at any time since before the Six Day War of 1967 - or possibly since 1948. 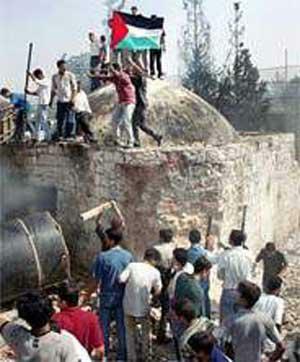 Palestinian street rabble takes over Joseph's Tomb in Nablus from the IDF. The enemies of Israel again feel they are on the road to eliminating the "Zionist entity." Listen closely; hardly a word of caution or skepticism emerges from them; they agree their moment has arrived. Re-establishing the acceptance of 1991-93 won't be easy for Israel. It will require great exertions and probably substantial sacrifices. But, with enough will, it can be done. Jewish colonisers, guarded by Israeli soldiers, stormed Thursday a mosque in the West Bank city of Nablus and performed rituals in it, local sources said. The sources said that a number of armed colonisers stormed "al-Nabi Yossef" Mosque in the city and performed Jewish prayers and rituals inside it. They added that the colonisers stayed in the mosque for long time, stressing that the Israeli soldiers, in the area, did not even try to prevent them from storming the Mosque. Oct. 13, 2006 update: Coincidentally, a day later, Michael Freund reminds one of the low point that the loss of Joseph Tomb represented, in "Restore Joseph's Tomb… and our dignity." It includes the observation that "that horrible day ... encapsulated everything that was - and still is - wrong with Israel's approach to the Palestinians."